I was recently chatting to someone about the China and I just thought I’d post a photograph taken there five years ago. 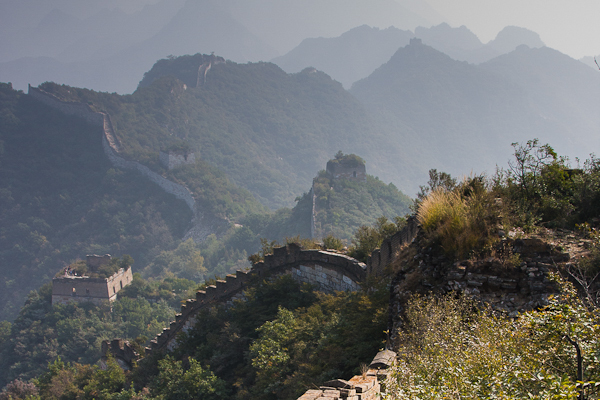 One thing you simply have to do when in Beijing is visit the Great Wall. There are several sections readily accessible from Beijing and many hostels and hotels offer day trips to these. The most popular section is Badaling. Completely reconstructed, it offers all the tourist amenities; toilets, coffee shops, souvenir stalls, cable car lifts to name but a few. Problem is everyone goes there – several people I bumped into even referred to it as Disneyland, which should give an idea as to the experience you’ll have! Most of us are aware of the Great Wall of China, so I’m not going to go into the details other than to say that the Great Wall is, strictly speaking, several walls built over a 2200 year period and stretching 6400km or so. Many sections have disappeared altogether whilst others are in a state of dangerous disrepair. As can be seen here, the section of the Wall at Jian Kou is losing the battle with nature and hence its more familiar name of ‘The Great Wild Wall’. The Wall served a number of purposes, the primary of which was defensive. Over the course of the Wall, the frequency of the guard and signalling towers varies, but here at Jian Kou they can be found on a regular basis. Presumably this is due to the mountain terrain – from a given vantage point you don’t get to see much of the Wall before it disappears over some ridge. An attack from the ‘northern hoards’ could be communicated back to Beijing via smoke (during the day) or fire (during the evening) in very short order. The signalling system was pretty elaborate too and could communicate such facts as the number and nature of invaders over 500km in a number of hours. You don’t so much walk this section of the Wall at Jian Kou as hike it. You are continuously climbing and descending as the Wall undulates its way over the mountains and it’s a very picturesque way to keep fit. For us hiking the Wall today we also have to contend with the vegetation that has taken hold. Also the appearance of the Wall varies over its length – local materials have been used wherever possible and at Jian Kou the rocks are laden with the mineral dolomite, giving a white appearance. Well, I was hoping to get out in Cambridge for some night photography but the consultancy work ran on longer than expected. So instead I thought I’d post from a couple of years ago of another well-known city. The low light conditions meant that a one second or so exposure was required but I didn’t have the tripod with me at the time. The image was taken by holding the camera as steadily as I could on one of the bridge railings and trying to time it so that the groups of people who were constantly crossing the bridge weren’t causing too much vibration. 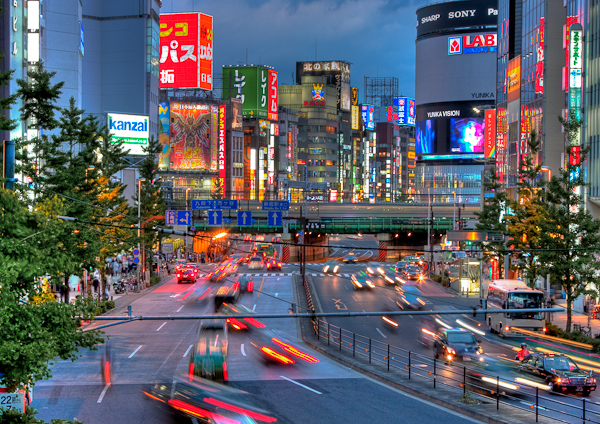 During post production I created an HDR image off the single shot to push the colour saturation – it felt appropriate given that many feel slightly overwhelmed by the full-on nature of Tokyo the first time they visit it. 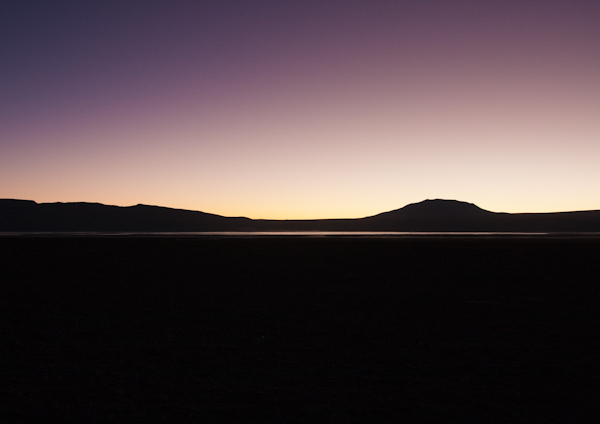 Back in 2010 I ended up in southwest Bolivia on a brief trip that changed my appreciation of the environment. The southwestern region of Bolivia lies high up in the northern Andes at an altitude between 4,200 and 4,800 metres. Its a barren, volcanic region, desolate and undeveloped. There’s no electicity; the only water in in the form of the lakes which are so heavily laden with volcanic minerals that the only life that survives in them is microbial extremophiles; there’s no roads, no cell coverage. Nothing. I fell in love with it immediately. The problem is that most of southwest Bolivia is a mineral, natural gas and rare element goldmine, primarily due to in being in a volcano belt. As a result the Bolivian government is under extreme pressure to allow mining rights which would greatly aid the impoverished country. If that happens, scenes such as the one here will soon be impossible.